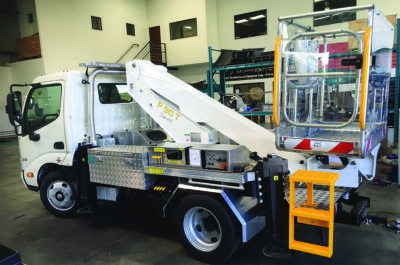 Truck Mounted Access Platforms, are manufactured for a variety of appliances like maintenance of electricity grid, telecom network but also trees pruning and trimming, façades cleaning, and maintenance of gutter, frames. 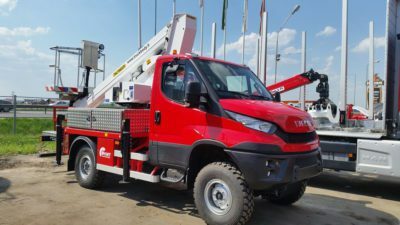 These truck mounted cherry pickers, despite their size and weight, allow you to operate relatively quickly due to an easy implementation. Our truck mounted work platforms, with their telescopic arm, allow you to work at heights between 8.8 metres and 25.5 metres. They also have an outreach of between 5 metres and 20 metres. Due to this the vehicle does not need to be moved if you have to operate on the other side of the street. If you have a lot of material to carry on, notice that the safe working load in the baskets of our telescopic work platforms can support up to 280 Kg. Other advantage of these truck mounted aerial platforms are the load capacity. Our vehicles profit from a very unique load capacity that allows you to transport heavy equipment. If you would like more informations about our range of truck mounted telescopic work platforms, please contact us.